Summertime will always hold my heart, but as the years go by, I get excited about autumn more and more, every time it comes around. There’s something heartwarming about the fall flavors of pumpkin, cinnamon, ginger, and butternut squash. 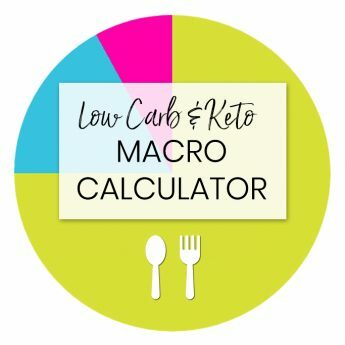 And even though some of them can pose a challenge for a low carb or keto diet plan, I find ways to include them all. This creamy low carb paleo butternut squash soup recipe with coconut milk is a prime example. Paleo whole30 butternut squash soup is pretty straightforward. Most of the common ingredients naturally fit into these buckets. All you have to do is make your butternut squash with coconut milk, avoiding any dairy, and it’ll be both paleo and whole30 friendly. 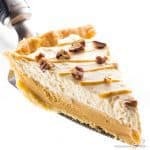 If you check the low carb keto food list, you’ll notice that butternut squash is not included there. 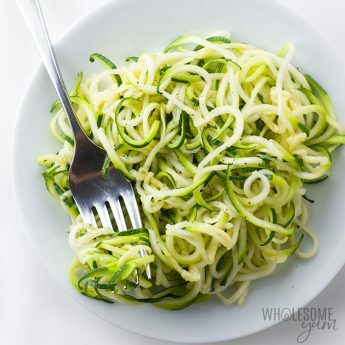 This is because, in general, it’s a fairly starchy vegetable – one cup has about 13 grams net carbs. 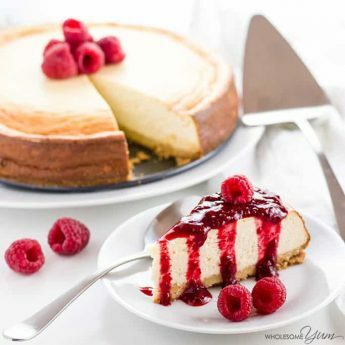 So, it’s not usually suitable for low carb or keto lifestyle – on its own. The good news is, butternut squash can fit into keto and low carb diets in certain instances. 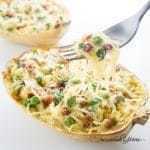 In part, it will depend on your personal carb restrictions, as well as what else is in your prepared dish. And, low carb butternut squash soup is one of the easiest ways to enjoy butternut squash on a low carb diet. Basically, it’s manageable if you make the soup thin enough. 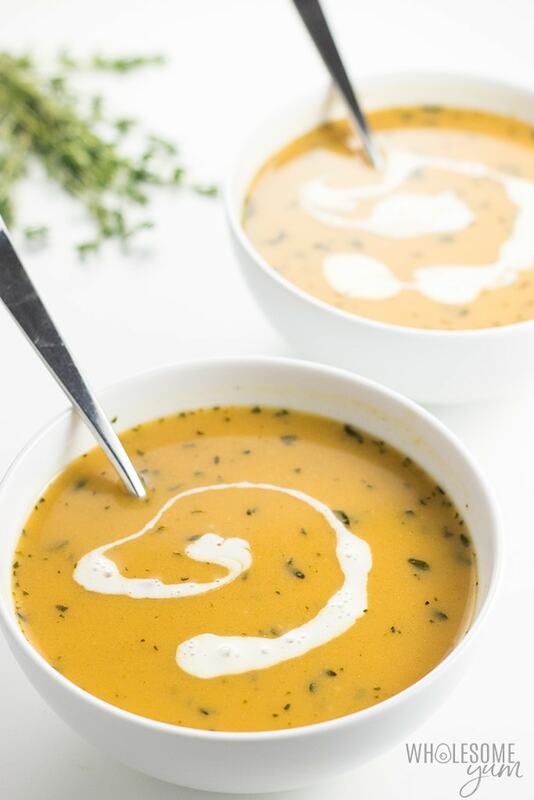 You don’t get that thick texture of some other paleo butternut squash soup recipes not aiming to be low carb, but you do get the delicious fall flavor of butternut squash. All of this being said, this whole30 butternut squash soup is not the lowest carb soup you can have. 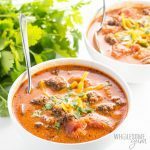 If you want a super low carb keto soup, try one of my other keto soup recipes, like broccoli cheese soup or beef cabbage soup. 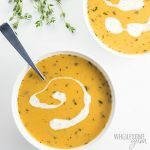 But if you’re really missing butternut squash and want to enjoy some autumn flavors, try eating some extra low carb foods the rest of the day and squeeze in this delicious low carb butternut squash soup. 1. Use more squash and less broth. This is the most common, obvious method. Using more squash and less broth will make it higher in carbs, but is fine for paleo whole30 butternut squash soup. If you are aiming for it to be low carb, it is not the best option, though. 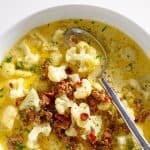 Is there anything cauliflower can’t do?! It’s surprisingly good at thickening soup. For maximum flavor, roast cauliflower like this, or for a quicker option just steam or even microwave it. Then, puree it before adding to the soup to thicken. 3. Use xanthan gum or gelatin. Xanthan gum and gelatin are both common low carb thickeners. With either one, whisk it with some broth first, before adding to the soup. 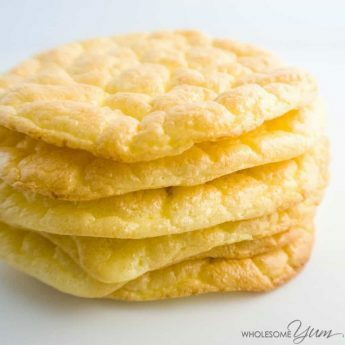 Be careful not to add too much, so that you don’t get a slimy texture, especially with the xanthan gum. To be safe, do 2 tablespoons at a time of gelatin or 1/2 teaspoon at a time of xanthan gum until you get the result you want. It still won’t be exactly like a pureed paleo butternut squash soup, but definitely thicker than without adding these. It’s possible to make paleo butternut squash soup ahead of time in various stages. You can just roast the squash ahead of time, make the whole soup ahead and refrigerate, or even freeze it. Can you freeze butternut squash soup with coconut milk? Yes, you can! Simply wait for the soup to cool to room temperature, then pour into quart-size ziploc bags. Place them flat in the freezer until solid, then you can move them around anywhere you’d like. Don’t use bigger bags, because it will be difficult to reheat. When ready to use, you can place the frozen block of soup into a pot and heat over low heat, stirring occasionally. Another option is to defrost overnight in the fridge first, which reduces the chance of splitting. However, as long as you use low heat, it should be fine. 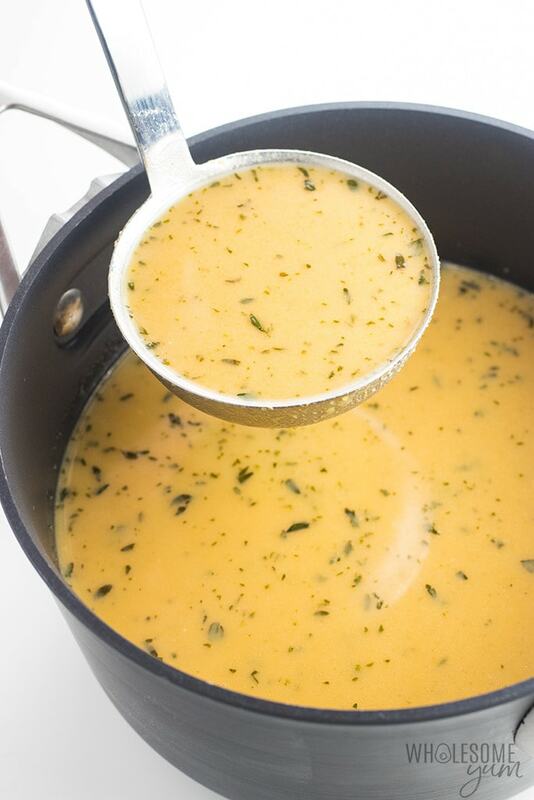 If your soup does break when reheating, you can puree it in a blender or food processor again to bring it back together. How long does butternut squash soup last in the freezer? A really long time! Low carb butternut squash soup with coconut milk retains its best flavor for about 6 months in the freezer, but is safe to eat beyond that. Baking sheet – Any kind will do, but this is one of my faves. Dutch oven – You can use either a stock pot or dutch oven like this one. Immersion blender – For pureeing your butternut squash soup! Preheat the oven to 400 degrees F (204 degrees C). Line a baking sheet with foil or parchment paper. 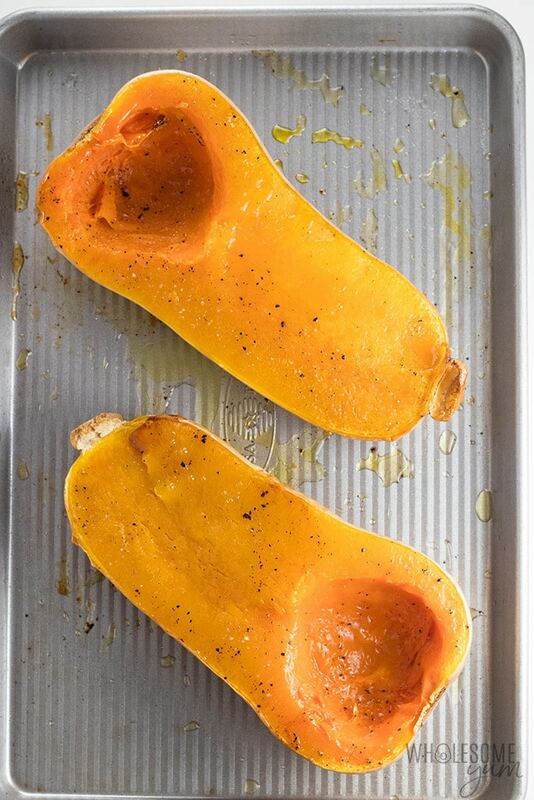 Place the butternut squash halves open side up onto the baking sheet. 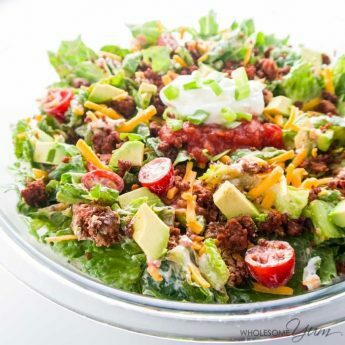 Drizzle with a tablespoon of avocado oil. Sprinkle with sea salt and black pepper. Flip over, face down. Roast the butternut squash in the oven for about 40-55 minutes, until a knife goes in easily. When the squash is about 30 minutes into roasting, heat the remaining tablespoon of avocado oil in a large pot over medium heat. Add the minced garlic, cinnamon, nutmeg and thyme. Saute for about a minute, until fragrant. Add the broth and coconut milk. Simmer for about 20 minutes, or until the squash is done. Scoop the squash out of the shells into the soup. Use an immersion blender to puree until smooth. Nutrition info assumes a 2-lb butternut squash yields 1.5 lb edible portion. This was delicious and so easy! I added cauliflower because I did want it thicker. I followed everything else though and it was a lovely soup. I topped mine with spicy, sautéed shrimp. This soup is AAAMAZING! I used heavy cream instead of coconut milk. If I freeze it using heavy cream will it separate when thawed or will it still be fine when heated slowly ?? Thank you so much, Terry! 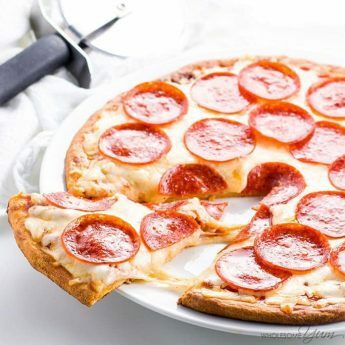 Yes, you should be able to freeze it just fine as long as you thaw first and reheat slowly. I was wondering if I could use butter it squash that’s frozen and cooked and just needs to be heated up? Hi Nicole, Sure, you can do that! I made this for dinner a couple of days ago. It was delicious! I cooked the squash in my Instant Pot instead of the oven. Then assembled the rest of the soup in the Pot. I used homemade chicken bone broth that I made in the IP too. I think it really adds to the flavor. Also added a little bit of grated fresh ginger to it. Served it with a small dollop of sour cream on top. Hubby loved it! I froze the leftovers to take to my elderly parents for a healthy easy meal. This was so good! The only thing I’d change it to increase the spices to 1tsp cinnamon and 1/2tsp nutmeg. I took your note about mixing xanthan gum with chicken stock to help thicken the soup. 1/2 tsp was all it needed to get the perfect consistency. I am so happy to hear that, Nikki! Have a great day! Hi! I am very similar when it comes to fall flavors. I am doing Keto. I was wondering if you could add heavy cream instead of the coconut milk? Would that pose as a thickening agent and make it higher in fat content? Hi Serenity, Yes, you can use heavy cream instead of coconut milk. The nutrition info is a little different, but both are high in fat. The cream would not make it any thicker, but I have some tips in the post if you want a thicker soup. Hi Gayle, I have some tips about this in the post above.